Here are some fascination things you may not know about potatoes: * They gave a name to the long-ago “Potato War” in Europe, when Austrian and Prussian armies ate all the potatoes along the battle lines-and then stopped fighting. * They gave us two president of the United States. In the 1840s, when blight destroyed the potato crop and brought famine to Ireland, more than a million Irish came to this country. Among their descendants: John F. Kennedy and Ronald Reagan. * They can help you wrap a present. Cut a potato in half, carve out a design (remember how you did it in kindergarten? ), and stamp out your pattern with paint on plain wrapping paper. That’s just a little of the lore that surrounds this humble yet versatile vegetable. But potatoes are also one of the world’s most important food crops. Potatoes were first grown by Indians in the high sierras of the Andes in South America. they were carried to Europe by the Spanish explorers, and their use spread from there. Today, just one year’s potato harvest is worth more than all the gold and silver the Spanish took from the New World. A lot of people used to believe that potatoes were fattening. Now we’re discovering that just isn’t true. Most of the calories aren’t in the potatoes, but in what’s added to them – butter, sour cream, gravy, rich sauces, fat that’s absorbed in frying, mayonnaise coating the potato salad. Potatoes by themselves are a real nutritional bargain – low in calories, free from fat and cholesterol, and rich in vitamins and other nutrients. The 5 ounces of potato flesh you eat when you have a medium-size baked potato has about 145 calories, with 3 grams of protein and 34 grams of carbohydrate. It’s rich in vitamin C; men on Spanish ships, sailing home from the New World, ate potatoes and avoided scurvy, which is caused by a lack of vitamin C. Potatoes are also rich in B-vitamins, iron, and other important minerals. What’s more, they’re low in sodium and high in potassium, which benefits muscles and blood pressure. The rich, sweet taste of sweet potatoes makes them popular. They are a major source of vitamin A and also have some vitamin C, b-vitamins, iron, and other minerals. Both types of potato are high in fiber, which fills you so you’re not tempted to eat so much other food. Prepared potato dishes from supermarket freezers, takeout counters, or fast food places are easy eating, but they’re often high in fat, calories, and salt, and they’re likely to be lower in vitamins. When you cook potatoes for yourself, you can cut calories and suit your own taste. And it’s easier than you think. Here’s some advice from experts on buying, storing, and cooking. Potatoes aren’t all alike, either. The big, mealy Idaho is one of the best in the world for baking. Smaller, thin-skinned new potatoes are better for boiling, mashing, and potato salad. A new variety called Yukon Gold gets high praise. It has butter-yellow flesh and a flavor so buttery all you need is seasoning. Look for it at the market in late summer and fall. If you are out doing the shopping, and potatoes are on the list (maybe you put them there! 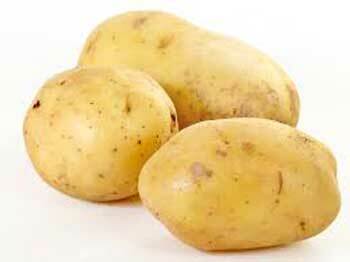 ), look for potatoes that are sold loose and unwashed. Pick those that are firm and smooth, without cuts, blemishes, or greenish areas. Green color indicates the development of solanine, a compound that can be toxic. Don’t buy more than a week’s supply. At home, store them unwashed, preferably in a place that’s cool, airy, and away from sunlight. In a warm place, potatoes start to wrinkle and sprout. In the refrigerator, their starch turns to sugar, and the taste is unpleasant. Most nutrients are stored close under the skin, so it’s better to cook potatoes with the skin on. Scrub off dirt first with a brush under running water. Cook peeled potatoes in soup or stew to retain the nutrients that dissolve in liquid. Trying to watch your waistline? Instead of butter or rich sauces on potatoes, try: – yogurt with finely chopped chives or green onion – cooked mushrooms or other vegetables – grated cheese – or gravy with the grease skimmed off. Cut the fat and calories by having: – oven fries instead of french fries – potato salad with light oil and vinegar dressing instead of mayonnaise – mashed potatoes made with milk instead of cream. Potatoes are popular with good reason. Give them the right treatment, and they’ll help you keep trim. Don’t throw out the peelings; they make a wonderful snack. Wash the potatoes first, and peel in wide strips with a vegetable peeler. Toss with about a tablespoon of melted margarine per cup of peel. Bake on a cookie sheet, about 15 minutes at 425 degrees, or until crisp and golden brown. They’re so tasty they don’t need salt. Preheat oven to 450 degrees F. While cutting potatoes keep strips in ice water to crisp. Drain and pat dry on paper towels. Sprinkle with oil, and mix with hands to distribute oil evenly. Bake on a cookie sheet until golden brown and tender, about 30 to 40 minutes, turning often. Sprinkle generously with paprika, lightly with salt. Serves four. Wash potatoes (but don’t peel them) and cook in boiling salted water, until just tender (test with a fork). Drain, let cool enough to handle, peel, and slice. Put in deep bowl, and add salt, pepper, oil, and vinegar, all mixed together Refrigerate to cool and develop flavor. Two hours before serving add onion and parsley. Taste and add extra oil, salt, pepper, if needed. Serves six. The white potato is related to the tomato, the eggplant, and tobacco. Its botanical name is Solanum tuberosum. It’s not a root but a tuber – part of an underground stem. It can grow in cold, harsh climates, as in the Soviet Union and Scandinavia. In non-stick skillet, fry Canadian bacon, stirring to prevent sticking. Add margarine or oil, and saute onion until golden. Transfer meat and onion to large saucepan, add potatoes and broth. Bring to a boil, cover, and simmer about 20 minutes. Add corn, with its liquid, and milk, and heat, but do not boil. Simmer about five minutes. Taste for seasoning. Serves 4. ← Should You Consider The Good Morning Snore Solution?